There's a great hero in this book. Matt Cruse. 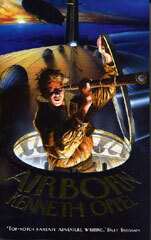 He's the cabin boy on board the luxury airship, the Aurora. He loves the ship and he loves his job, and he's got a fair expectation of being made junior sailmaker soon. Or didn't see it. Because at first, all I noticed was a blackness where stars should have been. I raised my spyglass again, and with the help of the moon, caught a glimpse. It was a hot-air balloon, hanging there in the night sky. Its running lights weren't on, which was odd. It's the opening incident in a dramatic tale of discovery and adventure, exploration and piracy. For although Matt manages more or less single-handedly to rescue the distressed balloon and bring it on board the Aurora, he is too late to save the life of the injured pilot. Is the pilot raving and deluded in his final moments? 'Did you see them?' he asked me, his voice scratchy. 'Who?' I wondered if he was thinking clearly. He tried to get up, pushing with his elbows like he had somewhere pretty important to go, but he didn't have the strength, and he sank back down. He turned to me again, swallowed. It seemed important to him so I lied. Matt might never have discovered what the pilot had been raving about that night but for a fortunate coincidence the following year when the beautiful Kate de Vries travels on the airship Aurora, first class. True, she's rich and used to having her own way, but she's also rather beautiful, and about the same age as Matt Cruse. And Kate is travelling for a purpose, which seems to include the cabin boy... They're a well-matched pair, full of spirit and imagination, and they certainly get things done. If you want to know what they get up to exactly you'll have to read the book. And I'll warn you now, it's one of those books that's difficult to put down until you've finished with it. Highly recommended!